It was a cold start to a late January morning as I headed up the trail towards Dream Lake from the Bear Lake parking lot. Fog and snow were falling on the landscape and it was as quiet as could be in the forest. Above Dream Lake I spied this group of spruce Trees along Tyndall Creek. 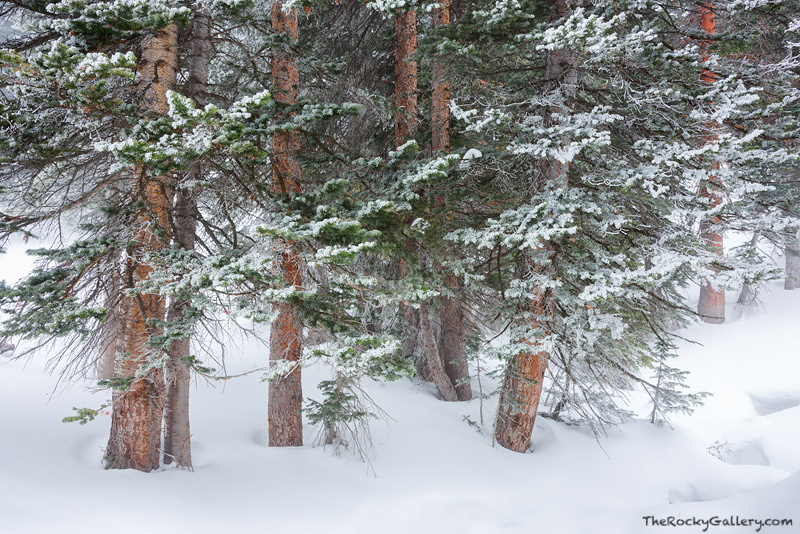 The spruce tree's red bark stood out against the white of the snow that had now covered the forest. Snow and ice frosted the spruce needles bringing new detail to this beautiful group of trees. Photo © copyright by Thomas Mangan.